Khloe and Lamar show leaving E! Lamar Odom and hid ride-or-die wife, Khloe Kardashian Odom have decided to end the reality show, Khloe and Lamar, which gave us glimpses into their life and the love they share. Lamar reportedly wants to focus on his career. Bravo, I say. Lamar Odom is the latest athlete to star in Nike Sportwear’s “Always On” original video series. September is Life Insurance Awareness Month and the Life and Health Insurance Foundation for Education tapped Los Angeles Laker Lamar Odom as their spokesperson. Odom benefited greatly from a life insurance policy his mother, Kathy Mercer, had in place prior to her early death. 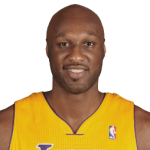 Lamar Odom passenger in limo accident According to E Online, an automobile transporting Lamar Odom to the funeral services of a loved one in New York struck a motorcycle Thursday, seriously injuring the two passengers on the bike. Read ahead for the UPDATE….